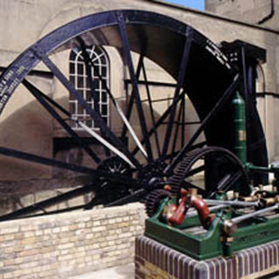 Before the invention of steam engines, many mines, mills and even textile factories used waterwheels to drive pumps and other machinery. The museum's waterwheel is a 20ft. diameter backshot wheel, driving a set of three throw pumps though a reduction gear. Each side of the wheel, or shroud, is made up of 12 sections bolted together with wrought iron spokes. In all there are 72 buckets arranged around the circumference of the wheel. Its original function was to pump water from the River Frome, in Wiltshire, to supply the Duke of Somerset’s estate and the village drinking fountain in Maiden Bradley. The Duke kindly restarted the wheel at its official opening ceremony on 17th July 1993. The Hindley Waterwheel is currently undergoing maintenance work.